Steve Harvey is kicking off his Fall Radio Season with a lineup of superstar guests and incredible giveaways Monday September 9th – Friday September 13th. Dynamic talk show and Family Feud host Steve Harvey, and his co-hosts Shirley Strawberry, Nephew Tommy and Carla Ferrell welcome some of movies, music, sports and TV's most popular entertainers and personalities. It's a "Don't-Miss Week" of The Steve Harvey Morning Show with superstar filmmaker Tyler Perry, hitmaker John Legend, HLN's Nancy Grace and Clark Howard, ESPN's Stephen A. Smith, and two of TV's favorite doctors, Dr. Phil and Dr. Oz, to perk up your mornings, share laughs, entertainment and the latest news, sports and information to inspire your health and lifestyle. The #1 rated show also has an additional double treat in store for listeners with the chance to win sizzling trips or jewels daily. Listen in starting Monday September 9th when listeners can get lucky with The Steve Harvey Morning Show's week of double giveaways. Listeners have the chance to dazzle with diamonds from Hollywood jeweler JNJewels by registering at www.SteveHarvey.com, to win giveaways for women and men. Each day, one lucky registrant will be randomly chosen, and receive a women's diamond ring and a set of men's diamond cuff-links, valued at $6,000, compliments of JNJewels. The Steve Harvey Morning Show also has a super music giveaway, giving listeners the chance to win a dazzling trip to the sight and sounds of Las Vegas and the iHeartRadio Music Festival. Giving away 5 trips for two to Las Vegas to enjoy the sold-out festival featuring music's biggest acts performing September 20th-21st, for full details and registration listeners can register at www.SteveHarvey.com, with one lucky winner randomly chosen each day. Monday September 9th the mega-week lineup for The Steve Harvey Morning Show's fall kickoff begins with superstar filmmaker and producer Tyler Perry joining the show to give fans the latest insight on his upcoming film and television projects. Tuesday September 10th, follows with a dose of helpful tips and hit music for listeners when The Steve Harvey Morning Show welcomes two guests, HLN's consumer advisor Clark Howard, author of the new book "Living Large for the Long Haul," and award-winning musician John Legend, who will share more about his new album "Love In The Future." On Wednesday September 11th, HLN's legal commentator and popular host Nancy Grace joins The Steve Harvey Morning Show to talk about current topics and the hottest news stories. Thursday September 12th is the place to hear two big TV experts, when TV's favorite confidant Dr. Phil McGraw joins Steve Harvey to give fans a personal peek at what to expect this fall on "Dr. Phil," and passionate analyst Stephen A. Smith of ESPN's "First Take" shares his sports predictions for the NFL and NBA seasons. On Friday September 13th, The Steve Harvey Morning Show wraps its blowout week with TV's beloved doctor, Dr. Mehmet Oz, joining the show to share about his new season of "Dr. Oz" and weigh in on listeners' medical questions. 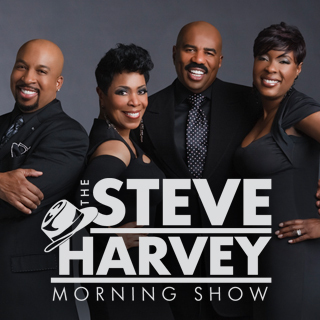 A #1 syndicated morning show, Steve Harvey and co-hosts Shirley Strawberry, Nephew Tommy, and Carla Ferrell bring The Steve Harvey Morning Show listeners inspirational advice, interviews, news, rousing music, the "Strawberry Letter," listener segments and more daily, on-air Monday – Friday, 6-10 am EST. Syndicated by Premiere Networks on nearly 70 radio stations across the U.S., The Steve Harvey Morning Show reaches approximately six million weekly listeners and is also available online at www.SteveHarvey.com, www.iHeartRadio.com, and on the iHeartRadio mobile app.